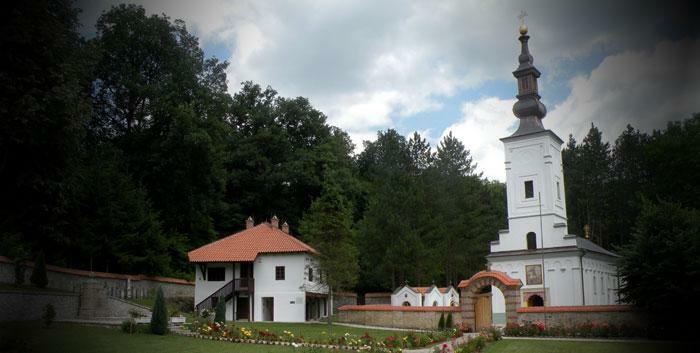 The monastery of Bogovadja is located near Mionica not far from Valjevo. Tradition says that blind Grgur Brankovic founded this monastery and lived there until his death 1548. The Dabin Gospel that is preserved in Bogovodja contains an inscription by Haji Ruvim which says that he came to the ruins of the monastery of Bogovadja with his brother hieromonk Mardarije and built a church in honour of St. George. The founders of the church in 1545 were Pavle and Jovan Velimirovic, landowners from Jabucje. During the first half of the 18th century there was a school in the monastery. In 1761 the monastery was looted and in 1789 Bogovadja was burned by the Turks. The Bogovadja monks moved to the monastery of Velika Remeta (Srem). Haji Ruvim started construction of a new church in 1791 which was completed in 1794. He built a fountain next to the monastery that is believed to have holy water-Gods water,thus the opinion that this is where Bogovadja received its name. In 1813 the Turks destroyed the monastery again. The monastery was considerably damaged during the First World War (1914) at which time Haji Ruvim’s library was destroyed and the monastery bell was removed. The church was renovated in 1930. Construction of the church and restotation of the residences lasted from June 10, to December 10 , 1816. The main builder was Milutin Godjevac from Bosnia and Princ Milos personally supervised the work. In 1852 a new , larger church was finished that still exists today. The church of Bogovadja is a single nave structure with a short transept in front of the altar and a tall Baroque bell tower on the western side. The iconostasis was painted in 1858 by Milija Markovic ,a painter from Pozarevac, with his sons Radovan and Nikola. The naib church was painted with frescoes in 1901.